The Annai Vailankanni Church is more than just a church; it is also a place of worship, evangelization, pilgrimage, and reconciliation. It is a local parish with some 1600-odd families holding as members to the church. The shrine of Annai Vailankanni was built in the year 1972, and further expanded in the year 2000. The church witnesses a lot of visitors throughout the day, and through the year (open 365 days) to take blessings of the shrine. Along with this, the masses offered here, are looked forward to. The architecture of the church is another striking highlight of this Chennai attraction. For Holy Mass and Devotion timings refer to the official website. 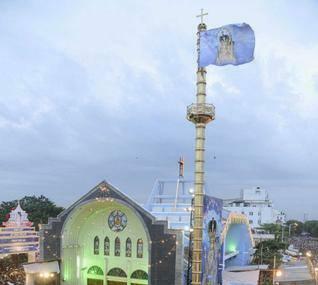 How popular is Annai Vailankanni Church? People normally also visit Kalakshetra Foundation while planning their trip to Annai Vailankanni Church. The Best church ever for a peaceful prayer. I've got many fulfilled intensions. Powerful church that's why always crowded.... Spacious for car n bike parking as well. You can also enjoy Bessy beach in a walk away distance. A very popular place of visit for people of all faiths. Open till 9 pm and beyond depending on crowd. Weekend and festival days see more devotees, most of whom are from other parts of the city. Popular for marriage ceremony, both official and private. Function hall available for receptions . The new church should be ready this year! Pleasant place to visit. To reach here, bus could be the best option. You feel very peaceful.